Partial dentures are a simply and affordable solution for someone with missing teeth. They are used for replacing one or more missing teeth from the patient’s upper or lower jaw. The partial denture is set and attached alongside the remaining natural teeth. The partial denture fits gently against the remaining teeth and gum. Partial dentures assist in preventing the remaining natural teeth from losing position whilst potentially enhancing the aesthetic of the mouth and gum. Peninsula Dental provides people from the Rosebud/Greater Mornington Peninsula area with custom-fabricated partial dentures. Contact us today to make a booking with our friendly team of dental professionals. The partial dentures made by Peninsula Dental can be easily adjusted during production in case there are any changes. We utilise the highest quality materials when making our dentures to ensure quality and an incredibly lifelike aesthetic. 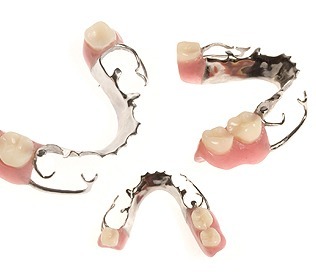 We produce partial dentures that are designed to look similar to the remaining teeth in the mouth. Are Partial Dentures for Me? You have lost teeth and need a partial denture to fill the place of the missing teeth. You require an affordable dental solution, or it may be the first time you have received a partial denture. You need a partial denture for stabilising the pre-existing teeth and gum. Looking for a dental clinic on the Mornington Peninsula that can determine whether Partial Dentures are right for you? Contact us today on (03) 5981 2255 or book online peninsuladentalcare.com.au for a consult so that we can assess your suitability and to further promote the health of your teeth and gums.